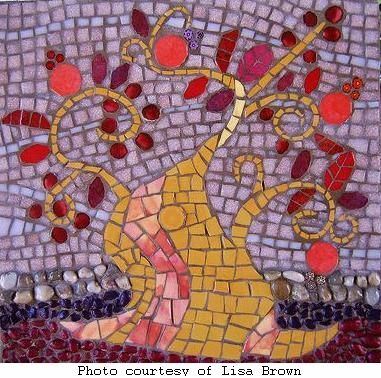 There are endless possibilities when it comes to mosaic tile projects. From smaller projects for beginners and children, to large floor and wall projects for the more advanced artist. Maybe you are not on your first mosaic and you are looking for ideas for other mosaic tile projects, then you will find some here. You can also share your mosaic with other readers by submitting it in the Making Mosaic Photo Gallery. By doing so you can show off your mosaic to the world with your very own web page. Best of all these projects don't have to cost much. Try using what you already have such as an old table, or any tera cotta flower pot lying around. The possibilities for making homemade crafts are truly endless! As time goes by and you have done a few small mosaic tile projects of your own, you might want to create more lasting projects. For instance, If you are about to lay down new floor tile in your dinning room, why not add a beautiful border around your table, or at the entrance. Borders also serve well as a transition or threshold from one room to another. If you are thinking of installing a granite counter top or adding a tile backsplash in your kitchen, why not add a border or a beautiful wall mosaic over your stove! A kitchen backsplash is an ideal area to display mosaic wall art. How about a staircase landing or a vestibule, the perfect places to incorporate a medallion or a compass rose. These types can also be built-in a hard wood floor. Don't worry about the installation of these mosaics. If you do not feel comfortable enough to install new flour tile yourself, you can get it done by your local contractor who will install the mosaic for you. Your job is to make your mosaic! 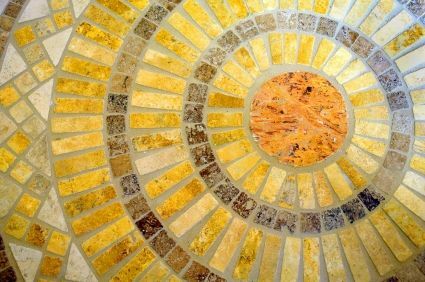 Other mosaic projects can be done in the bathroom where you can put a mosaic around the bath, on the floor or make a beautiful mosaic shower stall. Adding mosaics in your bathroom designs will add texture, beauty and value to your project. You can also create a beautiful mosaic around your fireplace. Now that you've decided to start your own mosaic art project, you can learn how to create patterns or just select one from the many free patterns available here. If you want other project ideas that you can make yourself Do It Yourself Gifts has many unique homemade gift projects for any occasion. Return to Making Mosaics Home Page.